I didn’t like Mad Men much this week, except for Pete and Trudy’s crazy Charleston. But I was thrilled in a sick way by the mention of the Tigertones. 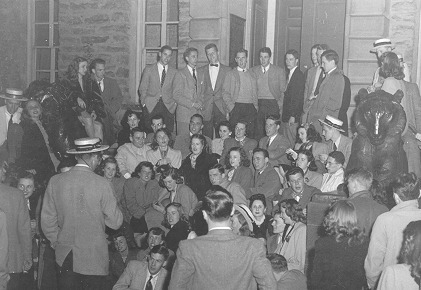 Yale, like Princeton, was still overrun with singing groups in the 1990s, and their members had weirdly high campus status and a tendency to harmonize at the drop of a hat. My college roommates managed to date at least 5 Whiffenpoofs (not at one time), so I could not escape. My least favorite a capella song? “Carolina In My Mind” as sung by the Duke’s Men. Here’s footage of the Tigertones preforming “Runaround Sue” in 2007.